In another effort to undermine the value of public education, the libertarian/limited-government-through-litigation group The Goldwater Institute sent out another email with misleading, outdated and disingenuous information. Their "pitch" is that Arizona is spending more for education, and getting less for it. However, this dog won't hunt. This is an old message that has been debunked repeatedly. In 1979 Arizona was investing about 69% of the total general fund budget on K-12 schools, community colleges and universities. Today about 57% of our state budget is devoted to our schools. We are essentially paying LESS, and demanding MORE. While Arizona’s overall spending on education has increased during that same time period, it has not kept up with the growth in our population. 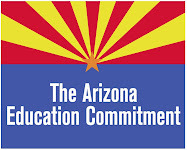 The American Legislative Exchange Council (ALEC) reported recently that Arizona actually spent more per K-12 student in 1986 than we did in 2006. This bears repeating: Arizona actually spent $61 less per student than we did 20 years prior…and those latest figures were released before the most recent spending cuts. The ALEC report also concurs with all of the other national education surveys that Arizona is ranked at the very bottom for educational investment among US states. "How much is Arizona spending per student?" The fact is that national surveys report that Arizona spends anywhere between $5,255 - $7,537 per student. However, special interest groups are claiming that we spend anywhere from $9,500 to “over $10,000” per student. Notably ATRA, the fiscally conservative Arizona Tax Research Association, agrees that Arizona funding is $6,200* per student. The per pupil funding dollar is derived by adding total dollars spent of the above three items and dividing by the actual number of students served. "Reactionary groups claim Arizona is spending $9,700 per student. How did they calculate that number?" In short, it's a numbers game. They use all the income on the JLBC Report (1/27/09), including lunch money, after school sports, adult night programs, adjacent ways (sewer & road repairs as a result of city maintenance), and other non-revenue dollars and divide it by the number of students. No other state counts this in their per student funding numbers. Reactionary groups use these numbers and include these things because they want to inflate this data in a period where Arizona is cutting education spending. They are using the hard work of the JLBC to spin their message. In taking a closer look at the 2000-2009 JLBC report, it is important to note that the 2009 figures are an estimate. They do not include the cuts of $270M to K-12 Education or the elimination of $362M in New School Facilities (NSF) funding made during 2009. "Are these statistics acceptable for a 21st century classroom?" For a full report on the above statistics, see Arizona K-12 EXAMINATION OF THE FACTS 2009, pdf.